Thank you for considering All Season Heating and Air Conditioning for your indoor climate needs. We pride ourselves in doing exceptional work and providing true value for your installation dollar. Our highly trained staff holds certificates in various fields of service. Each job we do is approached as a problem to be solved and we will work with you, our customer, to repair or design a system that meets or exceeds your expectations and stays within your budget. 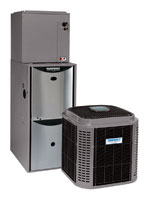 We recognize that every home and commercial space is different, and we have the necessary experience to install and maintain a wide variety of heating and cooling products. Even though your air conditioning and heating system may be running, it's not uncommon for it to be operating at half capacity. Let us make sure the performance of your system is operating at its peak and improve your comfort as well as the safety and energy efficiency of your system. Now you have read about us, take a peek at testimonals to see what our customers have to say.